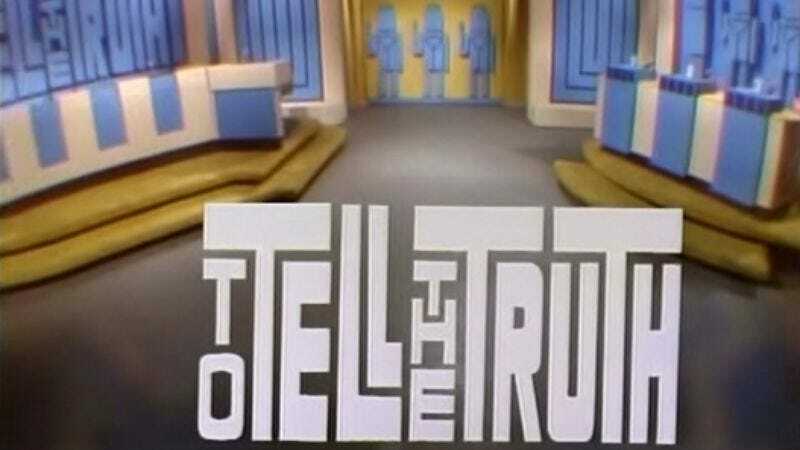 Deadline reports that FremantleMedia is preparing a remake of To Tell The Truth, the lie-detection game show that first aired in 1956 and continued until 1978, with a few brief revivals since then. (The most recent iteration was a two-season affair hosted by John O’Hurley.) The Mark Goodson-produced, Bob Stewart-created format pits four witty celebrities against a panel of three guests, all of whom claim to be the same person with an unusual story or job—a professional alibi preparer, say, or a sleeping-position expert. The celebrities’ job is to question the guests to determine which one is actually who he or she claims to be. Ex-NBC chairman Jeff Gaspin is spearheading the project, as he’s apparently a fan of the show. That’s good to hear, but this part of the Deadline writeup is less reassuring: “Eyed for primetime on the broadcast networks, the new To Tell The Truth is described as an update of the familiar format with a surprising new twist that adds action and suspense and raises the stakes.” Game show enthusiasts have seen “more action and suspense! !” grafted onto lighthearted, low-key classics before, and it rarely works out well.